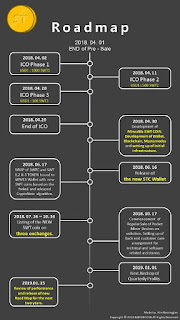 Development of mineable SWT COIN using a forked CryptoNote algorithm. 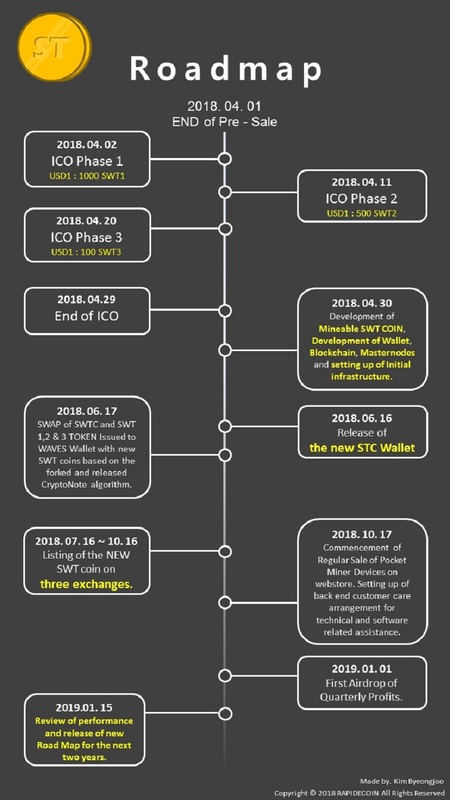 Development of Wallet, Blockchain, Masternodes and setting up of Initial infrastructure. The algorithm will be based on a proprietary Verified MacID Secured Payment (VMSP) infrastructure and the same technology will be used for (POW) mining as well. Mining can be done only on devices (Android based Pocket Miners that can also be used as Mobile Phones/Tablets) with built-in mining software, sold by SWT on our website through an exclusive Amazon Webstore and is secured by the unique MacID (machine ID of the device). More Details about the technology will be revealed in a White Paper to be released by the 15th of April 2018. More detailed information will be released once an application is filed for patenting both the product and the mining process based on the VMSP infrastructure technology. The profits generated from device sales will be shared via airdrops every quarter to all stake holders in the ratio of 40:40:20 meaning 40% profit shared with stake holders in proportion to the SWT Coins held by them as per a quarterly snapshot, 40% for future development and research to take the coin and the business to greater heights and 20% for maintenance of infrastructure and overheads. SWAP of SWTC and SWT 1,2 & 3 TOKEN Issued to WAVES Wallet with new SWT coins based on the forked and released CryptoNote algorithm. Listing of the NEW SWT coin on three exchanges. Prototype testing of Pocket Miner Devices for mining efficiency and device technical compatibility and stability. Manufacturing tie up for production of Pocket Mining Software and pre-order of Devices on SWT website. SWT plans to retain 30 percent of initial sale proceeds as cash as a safety net for investors. What this means is at any point in time if investors for whatever reason wish to sell back the coins after the SWT coin Wallet SWAP during the second half of June 2018 they can do so and get a minimum of 30% of their original investment as USD. For example, if an investor has bought USD 200 worth of SWT during the original SWAP or during the ICO he or she can sell back the coins for a minimum of USD 60 on the SWT website any time after 17th of June 2018. See white paper for more details about the business and financial security for investors. 한두개는 사기 일수 있지만 일단 돈이 안 들어가니. 하루 추천인 1인 가입 시 최소 1210코인 약 242$ (259,666원) 지급이 됩니다. 전 와이프, 아버지, 장모님 휴대폰과 제 여분의 이메일로 추가 가입을 했습니다. I will support you. Yeasterday i bought 150000000 coins , now i will buy another 600000000. I will not sell them soon. I hope i will make great coin ! What will be the future of the existing Key Coins on your YOBIT Exchange? We are not part of Yobit..